Commemorating the 100th anniversary of the tuba's demise in jazz (in favor of the string bass), composer/guitarist Johnnie Valentino rights the wrong with this unchained, funky, toe-tapping organ quintet, anchored by tuba. LA-based, South Philly-born Valentino, who has worked with Alex Acuña, Bennie Maupin, Pat Martino, and others, shows off his considerable playing and writing skills, further colored by his work as a Hollywood sound designer and film composer. The catchy, irresistibly funky tunes — propelled by New Orleans' second-line backbeat and Philly swagger grooves — will get listeners' attention, and the addition other not-oft-heard instruments (besides tuba) that were also casualties of modern jazz — clarinet and accordion (represented by harmonium) — make the tracks further enticing for a wide range of ears. Seasoned new music improvisers — Mick Rossi (Philip Glass Ensemble and recent Orion world-music project), Bob Sheppard (Peter Erskine Trio, Chick Corea's "Origin," Freddie Hubbard, Mike Stern), Mark Ferber (Lee Konitz, Don Byron, Russ Johnson, Larry Goldings) — having fun, so it's both contagious and listenable! 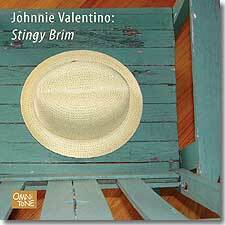 All compositions by Johnnie Valentino, Secret Light Music (ASCAP), except where noted. Recorded on 27 & 28 September 2004 at Wayne Cook's Studio in Los Angeles, California.